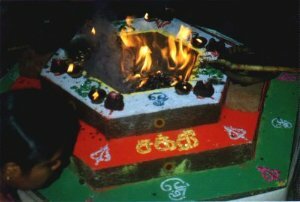 Below are pictures showing the use of fire in worship. In this case the fire is in a Yaha Gundam which is built out of clay or brick and sealed with earth. It must be built to exacting specifications in one of the shapes detailed above. Oblations are fed into the fire as the ceremony is in progress. 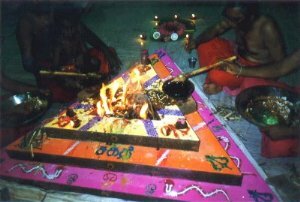 This type of worship is known as vaithiga rites. You can also see many small clay lamps which are also used. Two other types of larger lamp made of brass called Om Sakthi lamps (tall with a large Om) and Kaamatchi lamps (short with a relief picture of Goddess and Guru) can be seen in the pictures on these pages. These two lamps are for everyday use as well as in velvi and yagna.